Dr. Jack enrolled in Palmer College of Chiropractic in Davenport, Iowa. A clinic abroad trip prior to graduation allowed him to shape the way he wanted to practice by seeing the incredible impact of chiropractic on children. He and his fellow students traveled to Fiji, where there is no health care system, and many were interested in a free health checkup. “I witnessed chiropractic miracles in the time I was there. We were the second group of chiropractors to travel to Fiji, just three months after the first. The grand masters for the schools had already noticed a significant change in the students’ behavior and attention after they had received their first adjustment.” Dr. Jack knew then that he wanted to take care of children, having a powerful effect on their health early in life. Once he had children of his own, he felt an even deeper connection to pediatrics and fell in love with it. He sees all ages, from newborns on up and also enjoys adjusting pregnant women. 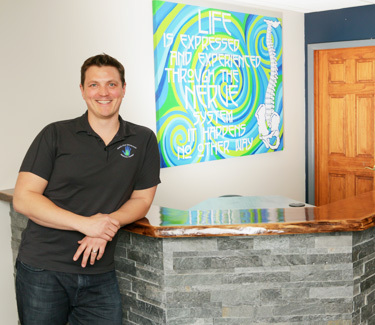 Outside of the office, Dr. Jack stays busy with his four boys, all of whom receive regular chiropractic care. Contact our practice today to learn more about what we can do for you and your family!